You turn your computer on in the morning ready for a day of work or school and nothing happens. No noise, no beeps, no action at all. Or you hear the POST beeps and the computer won’t get past the loading Windows screen. What happens to all your files? What do you do now? How can you recover data from the drive so you can continue using it? This is one of the more common data recovery problems we deal with here at Dave’s Computers. Modern computers and their components are actually very reliable. Much more so than a few years ago. Not so long ago, the MTBF (Mean Time Before Failure) of a hard drive was only around 50,000 hours. Now it is in excess of 1.2 million. This is an average though so there are no guarantees. Despite that, hard drives and computer components do go wrong and they usually pick the worst possible times to do it. Non-booting computers are very common. It could be caused by hardware, software or viruses and all can be fixed in one way or another. What isn’t guaranteed is being able to recover your data. Data recovery is not an exact science and if it is your hard drive that is causing the problems, chances are we won’t be able to do much with it. However, there are quite a few things we can do before we get to that point. Here are just a few of them. If you do wake up one morning and your computer does not, try one or all of these to see if you can get it working or recover data if nothing works. If your computer won’t boot or there is no life, don’t worry just yet. It could be something very minor causing the issue. Read ‘Most common computer repair requests: Windows won’t boot’ and try some of the techniques there first. I cover many of the common causes of a computer not booting. If they don’t work, there are a couple of other things you can do. Exactly what depends on whether your computer powers up but just doesn’t boot or whether there is no life at all. There are two aspects to this that we need to cover. We need to perform data recovery so you don’t lose your files. Then we need to get your computer back up and running again so you can use it. If your computer powers up but doesn’t load into Windows, we can do one of two things. We can use the Windows installation media to try to repair the file system or we can load a Linux live CD. I always prefer to repair Windows first as it gets your PC up and running again. A Linux live CD is great, but it does not address the core issue. It helps data recovery though. Load your Windows installation media and boot from it. Set your BIOS to boot from DVD or USB and press a key when prompted. Select Repair your Computer at the installation screen. Select Troubleshoot and Advanced options. Select Startup Repair. Follow the wizard to see if Windows can fix itself. If Windows can fix things, you should be up and running again and there will be no need for any data recovery. I would now take a backup of all the important data just in case. It could be a virus causing an issue so it may return. 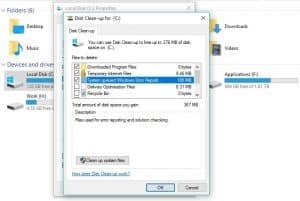 Run a virus and malware scan once you have copied your data. If that doesn’t work, you can go back to Advanced options and select Reset this PC. This will reload many Windows 10 features without overwriting your data. It isn’t foolproof and does occasionally overwrite files which is why it isn’t my first choice. However, it can have you up and running again so is worth a try. If Windows cannot repair itself, we go into data recovery mode. This means we get the computer up and running, copy any data we can onto other media and then reload Windows. As your hardware seems to be working fine, it is Windows configuration or software causing the issue. Reloading Windows will fix that but we need to save your data first. A Linux Live CD is designed to let you try Linux before you commit yourself. It loads a virtual operating system into your computer memory and lets you play around with everything before committing to installing it. We can use one of these to get your computer loaded. If you have access to another computer and an external hard drive to copy files to, try this. Download the Knoppix Live CD, get it burned to a DVD or USB key. Boot your computer from the Live CD and follow the simple instructions to get it working. Once in the Knoppix desktop, navigate to your Windows drive or storage drive. Copy everything you can onto your external drive. Knoppix will detect all your hard drives and should detect any external drive automatically. If it doesn’t, remove the external drive and add it again. Knoppix should detect the change and install the driver for it. Drag and drop all your files onto the external drive. If your computer doesn’t start at all and you have followed the steps in Read ‘Most common computer repair requests: Windows won’t boot’, you have only one option. To remove the hard drive and use it on another computer. If you’re lucky enough to have another in the house, remove it from your dead computer and add it as a drive on the other. Your files should then be safe. You can do this on a desktop and a laptop as you can remove the hard drives on both. Just be aware though that if your computer is under warranty you may void it by doing this. It would be better to put in a warranty call if this is the case. Alternatively, buy an external drive caddy that can turn an internal drive into an external one. Take the old drive out, put it in the caddy and connect it to another computer. Then you should be able to access your files as normal. If it is your operating system drive, don’t boot the other computer with it installed or it might confuse things. Performing data recovery on a dead computer is fairly straightforward but time consuming. Regardless of whether the computer boots or not, there is usually a way to save your data. Only if the hard drive itself isn’t working is the issue truly terminal.